Since I arrived in Northeast Ohio nearly 20 years ago, the Cuyahoga River and its story has interested me. Its history tells of industry, success, and beauty, but it also describes the impacts of decades of deterioration, suburban sprawl, and pollution. That juxtaposition of experiences is fascinating to me. Now add the pride I have for my adopted city, and you begin to get an idea of the passion I have for my community and what drives my desire to have a positive impact on where I live and work. 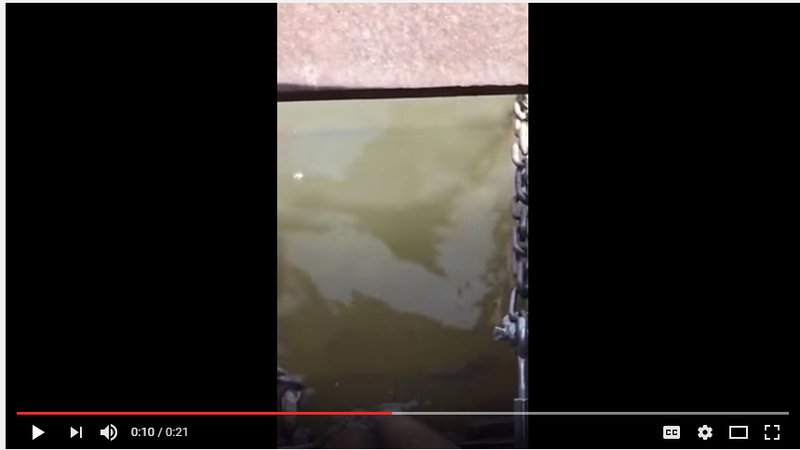 Our River in particular has seen a resurgence over the years. The implementation of environmental laws has helped clean up the waters being sent downstream, and 30-years of monumental efforts by some stalwart supporters of the River have made improvements along its banks virtually everywhere it passes. But how did all this happen? Not by accident, right? Nope. It was the people! People with a passion for the river and a desire to collaborate and problem solve. Any of us might all be able point to an example of how this passion and collaboration resulted in a positive impact on the river and its community. 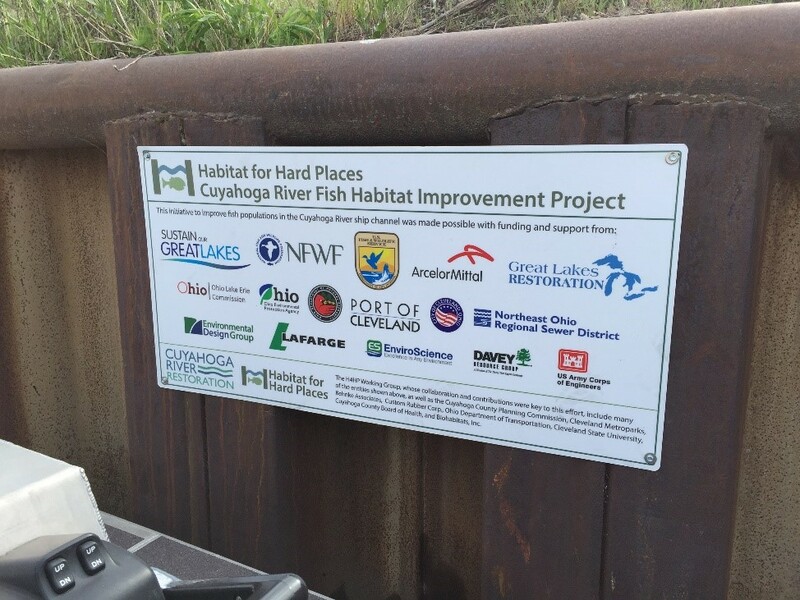 The example that is most personal and most recent for me is the Habitat for Hard Places working group, which was started by an organization called, the Cuyahoga River Restoration. To understand the significance of the story, though, it may be helpful to know a little history. As a result of significant pollution and degradation, the Cuyahoga River was designated as an area of concern by the U.S. EPA via the 1987 Great Lakes Water Quality Agreement. Since that designation, various groups have been working to improve its water quality and the lands and communities contacts. 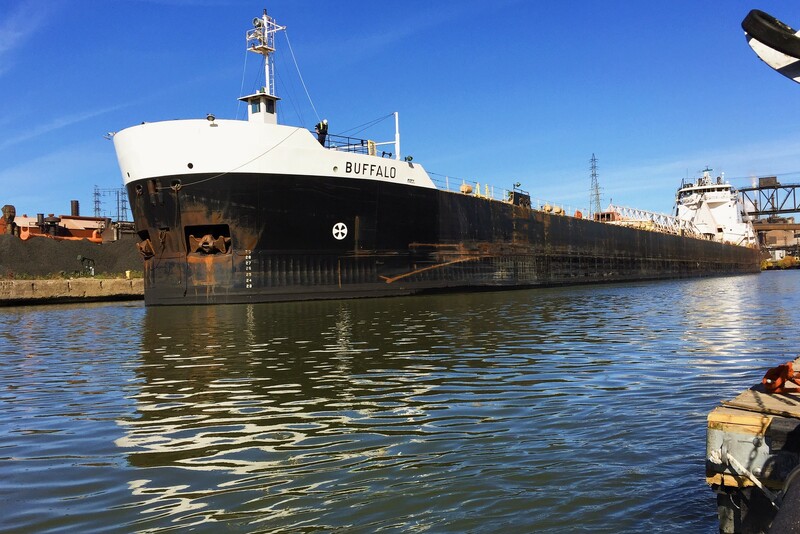 Almost 20-years ago, one such group embarked on a journey to change the face of the Cuyahoga River and provide habitat for the many species of fish known to roam the crooked expanse of steel and concrete that is the Cuyahoga River ship channel. Around our work table sat engineers, scientists, landscape architects, business people, non-profit administrators, and government entities. We all had a couple of pretty significant things in common. We were users of the river, and we all cared about the river. That shared spirit was not necessarily enough, though. We needed to work together, and to collaborate effectively. We needed to use our strengths within the structure of the group to contribute. The group collected and analyzed data to learn more about what fish were most prevalent in the river already were important to the success of this project. We were organized into sub-groups to attack specific elements of the problem such as the best location for our habitats or addressing access or property issues. Everything was moving forward with our passion driving us and our talents revealing the important “bits” of information that would be later translated into design. But it was not always smooth. Not everyone agreed, and communication was sometimes challenging – we all had “day jobs” after all. However, in the end, a mutual respect for each other likely fostered by our mutual passions, led us through the challenges and allowed us to get behind the ultimate designs. I am sure that this description sounds a bit “utopian,” and I may have even insinuated that it was “easy.” However, the hallmark of the Habitats for Hard Places group was that real work was done, and progress was made. In the spirit of true Edisonion Invention, prior projects were dug up and thrown back on the table. All the old challenges were reviewed. New data was collected and analyzed. Failures were evaluated. Goals were revisited. New designs and locations for habitat were brainstormed. The result of the tremendous amount of collaboration was another version of the manmade habitats for the Cuyahoga River Ship Channel. The design constraints were fairly basic. Structures needed to be made of steel and wood. All the designs needed to be extremely durable, and each needed to be small enough to be managed by one person. Each of the designs needed to be able to function at virtually any river water level. And perhaps most important of all was it needed to be very cost effective, and it could potentially be mass-produced. Environmental Design Group was awarded the honor of translating those many hours of design discussions into functioning prototypes for five future habitat structures to be installed, tested, and monitored in the Cuyahoga River Ship Channel. Through the process of fabrication and testing, eventually two designs were determined to be the best and had the highest likelihood of success. Each design provided a potential for debris collection (for shade), refuge for fry and small fish from predators, and provided features that mimicked natural habitat like root filaments, and the potential to add other habitat elements like aquatic plants or gravelly material. The collaboration had produced solid designs with a reasonable consensus around their function. At this stage, installation became the order of the day. Collaboration took hold again, and the stakeholders jumped in with support lending their expertise. 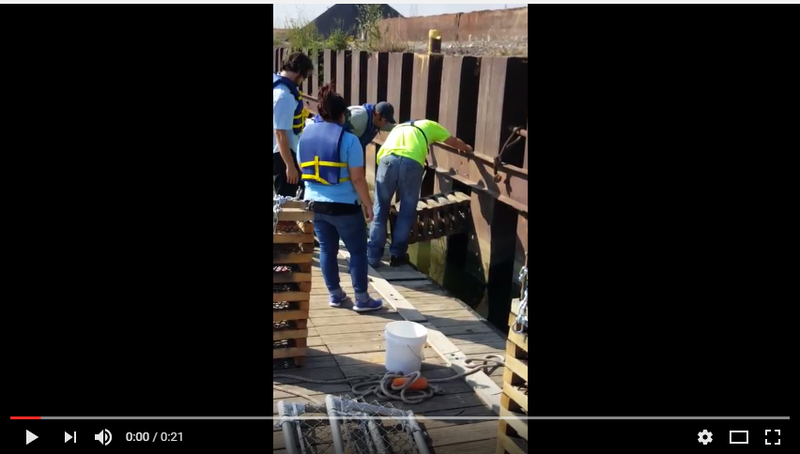 The team set out in boats to install these newly-constructed structures on the bulkheads of the upper three-miles of the Cuyahoga River Ship Channel. With massive support from the Habitats for Hard Places group, almost 500-habitat structures were eventually installed in the river. Amidst equipment challenges, coordination of volunteers and weather that did not always cooperate, we achieved the goal that we set for the pilot program. As time goes on, I have no doubt these designs and installations will be improved and enhanced. That is the very nature of a project like this. However, it will be the collaboration and communication that the Habitat for Hard Places team has established that will drive those changes and improvements. Environmental Design Group is looking forward to a long future supporting Cuyahoga River Restoration, the Habitats for Hard Places team, and the health and well-being of the Cuyahoga River. In the end, I think this story of passion and collaboration is a story equally as fascinating as the story of the Cuyahoga River because it is that story that can be applied over and over again within the context of improving our Crooked River. And I, for one, am looking forward to using the example and pressing ahead with new projects that I hope will equally impact the communities we serve.